The National Institute for Health and Disability Insurance (INAMI-RIZIV) of the Government of Belgium will host IFDM 2020. 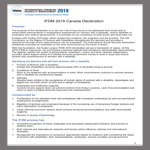 With IFDM 2016 having successfully concluded, and IFDM 2018 scheduled for Vancouver, the following IFDM in 2020 will move to Brussels. Mr. Francois Perl, Director General of INAMI-RIZIV, of Brussels, Belgium, was extremely pleased to announce that his organization had been accepted to be the official host for IFDM 2020. 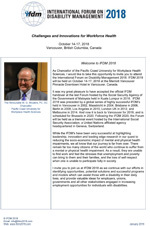 IFDM 2018 will be held in Vancouver, Canada, hosted by the Pacific Coast University for Workplace Health Sciences (PCU-WHS).